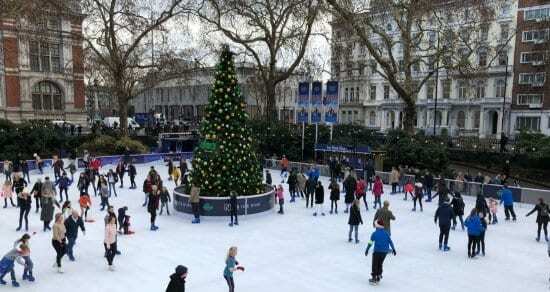 Temporary ice rink hire offers city centres, retail outlets and leisure destinations the opportunity to increase footfall and generate additional revenue during the winter season. We have a team of experts who specialise in designing and delivering ice rinks complete with skates, skate aids and ice-resurfacing machines. Made from real ice, our rinks are proven to deliver a fantastic customer experience. Any new venture can be daunting; our turnkey package takes away the stress by offering full planning, design, installation and management of your Ice rink offering. We can also supply any related temporary structures alongside your rink, housing skate exchange or catering services. Choose from ice rink hire or purchase options, we can create straightforward and simple ice rinks or full leisure destinations with catering facilities and event spaces. We have a breadth of experience delivering bespoke options for a wide range of venues and event types. Why choose Arena to deliver your next Ice Rink event? Our teams deliver over 30 rinks annually, in some of the most challenging locations in the world. We provide detailed site surveys, integrated build schedules and 3D visuals for all the ice rinks we supply, as standard. Leverage our years of experience to get the right design for your needs - balancing space available and customer experience delivered. Our ice rinks are made with real ice (never synthetic or rubber). Choose from a standard rink, a training rink, an ice path, an ice slide or even an ice bar! We deliver a diverse range of real ice offerings, tailor made for you. Fully owned inventory, local, risk free logistics chain. We use our own stock and never from third parties, thus giving 100% guarantee over supply, quality and safety. This is true of the ice rink, associated structures, skates, skate aids for kids and ice resurfacing machines. This delivery is known as the Arena Standard and is rivalled industry wide. We can supply a range of temporary structures for rink covers, restaurants/bars, kids party zones, receptions, skate hire or Zamboni storage. We can supply double deck structures with viewing galleries. We take away the stress by offering a full turnkey package including full operational management of the rink inc. staff, ice quality management, ticketing and marketing services. We also deliver the power, chillers, heating, sound and creative lighting services. We have live events in our portfolio that also include fun fairs, Santa's Grotto, licensed bars and catering. Whatever your vision, let us take care of it. Our dry hire includes everything from the rink, temporary structures, ice skates, skate aids and Zamboni hire. We offer full staff training, allowing you to be in control at all times of the ice quality and your customer experience. We remain on hand throughout your opening period to assist with any further support required. You choose, we will tailor make your solution. The highest level of health and safety is guaranteed, we are certified with ISO 14001, BS 8901, CHAS and NPORS. We are fully health and safety accredited and pride ourselves on our low accident rate on site during build, breakdown and indeed during our live events. We benefit from a team of interior designers who will support in designing the best use of your internal space, with heating, lighting and furniture to complement your venue. Increasing dwell time and customer experience is very much reliant on internal furnishing and ambience. We are committed to environmental sustainability, focusing on both waste and carbon reduction. Our aluminium ice rinks are 40% more efficient than competing products of different materials. We calculate our carbon footprint and off-set this by planting trees in the UK ensuring we are carbon negative. By planting trees in the UK we are supporting the domestic environment and the British economy. Each of our venues will receive a carbon offsetting certificate on hand over of the project. Diversify today and create new revenue streams. Add value for your customers, improve the customer experience at your attraction. We assist councils, tourist attractions, land owners and garden centres achieve new revenue streams. Add a real unique selling point to your customer offering today! We are committed to investing in both ice rinks and supporting structures. We own our own kit and have limited supply chain, therefore we can offer extremely competitive pricing. We offer a high end, self-stocked, turnkey solution at a truly competitive market price. Discount offers will be considered when we are supplying multiple elements such as rink and structure hire. You benefit from a competitive price and a hassle free supply chain. We are the market leader in the delivery of temporary, real ice rinks, with over 250 years experience in live events. 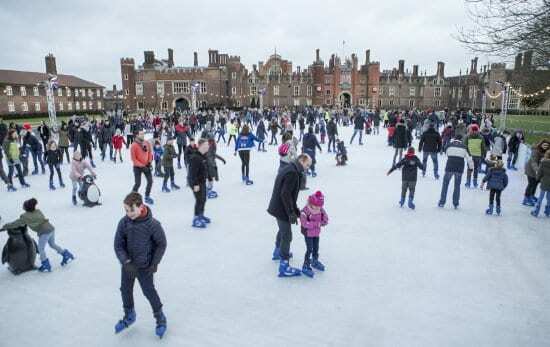 We deliver 30 rinks annually, from the iconic Tower of London and Hampton Court Palace rinks to the garden centre model at Van Hague. We have solutions for both ends of the spectrum. Below are some of the questions we often get asked, however, if you would like to speak to one of our experts’ contact us today. 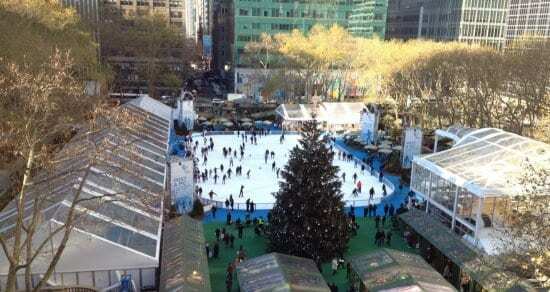 How many skaters may be on an ice rink at any one time? You need to allow approximately 3m2 per person. Do you use aluminium, synthetic or rubber ice rinks? We only use aluminium rinks, as they produce the very best and most energy efficient ice. Rubber based systems can be prone to melting should the winter season be milder than normal. Do you own all your equipment? Yes, we hold stock in excess of 30,000m² along with all ancillary products and services. We never hire from third parties, thus giving 100% control over quality, supply and health & safety. Successfully marketing your ice rink is vital to its success, and we have the services to help attract and retain customers from your catchment area. Do you supply your rinks globally? Yes. All our ice rinks, supporting structures and services are available globally. We have worked in UK & Europe, Middle and Far East and across the USA. Will my rink need a roof? Our clients are increasingly opting to cover their ice rinks, creating an all-weather facility. Is my venue suitable for a temporary ice rink? The most important consideration is the physical space to build the rink, and access to vehicles and equipment. You will also need water supply and power supply. All of these will be looked at during our site visits. Our rinks are available inside and outside and at any time of the year. We can provide everything you need for a working ice rink from the ice rink itself to the skates, skate aids, supporting structures for restaurants, cafes and bars, AV and audio equipment, creative lighting, sound systems, chillers, power generation, electrical distribution, furniture and interior design. We create a bespoke package to meet your objectives. Who looks after the ice when it’s up and running? During the rental period the surface of the ice needs constant maintenance; this can be done by a number of different methods, dependent upon size of rink and budget. We provide full training for your team, ensuring they understand how to look after the ice and keep it in top condition. What sort of ice rink do you provide? We only offer real-ice ice rinks. There is no plastic or imitation ice, which gives a superior experience for your customers. We use the latest ice technology which is low energy, sustainable, quick to assemble and easy to maintain. Again, this is dependent on the scale and complexity of a project and how much supporting infrastructure is required. If it’s a straight forward ice rink build it can take a couple of days. If there are additional structures such as restaurants with interior fit out, more time will be required. Your project manager will give you a time frame and provide you with a detailed build schedule. Each project is budgeted for on a case-by-case basis, dependent on requirements and complexity. Is there a minimum project scale? No, we have no minimum of maximum limits to the ice rinks we deliver. We can offer straightforward rinks or the construction of full temporary hospitality and leisure destinations. 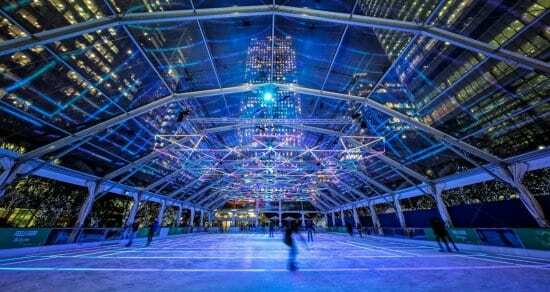 Who are temporary ice rinks suitable for? 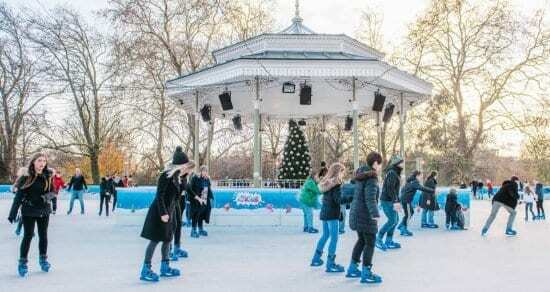 Temporary ice rinks are ideal for retail centres, garden centres, leisure destinations, museums, theme parks and any other area looking to increase revenue and drive footfall during the winter season. We have worked with clients as diverse as historic London venues to shopping malls in Dubai. We also provide long term ice solutions for sports centres, and can cater for activities such as ice hockey, curling and other ice related activities. The benefits are many; additional revenue streams such as advertising and sponsorship, increased footfall, increased customer dwell time, improved customer experience and the opportunity to diversify.